Trimit is a clever app for the iPhone, and soon a bookmarklet for your browser, that allows you to take large bits of text that you write or import from a link and shrink them down to fit into a social network update. The concept is clear and applies across the board to many different networks, but I found it best for Tumblr and Facebook. 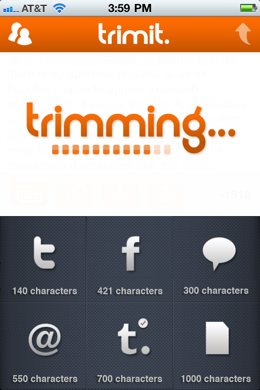 To shrink some text, you type it in, paste it in or add a link to Trimit [App Store, $0.99]. 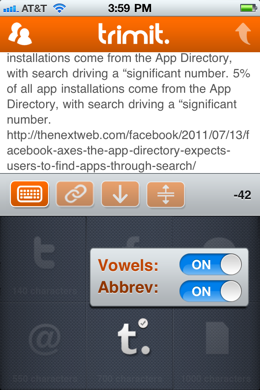 Then you shake your phone or tap the trim button on the app’s toolbar to get a miniaturized version of your text. Most of the time, you’ll end up with a fairly legible, although somewhat number-ridden version of your text. Things like ‘straight’ might be shortened to ‘str8’, for instance, and anything with an acronym gets shortened as well. This makes your text look a little undignified, but it does make sharing large blocks of text while keeping the main ideas intact fairly easy. The app offers the ability to share to a bunch of different networks, but I found that short messages intended for Twitter didn’t work as well for me. It was large banks of text that ended up working the best. When you only give the app 140 characters to work, you might as well just write your own summary. But if you give it 500-700 for Facebook or Tumblr, it really shined, giving up very pleasant results. It also tends to work just fine sending text in an email or to a text message recipient. The app is also beautifully and cleverly designed. It gets you started with the meat of the app within seconds, for one. I love apps that get right to the point. There are just four controls for settings, pasting a link that you’d like Trimit to grab, dropping said link into your text for context and the shrink button. Tap the settings button to drop a pane down to reveal which types of post you want the app to shrink your text to. Holding down on any of the options allows you to toggle Vowels and Abbreviations on and off for each type, that way you can choose to sacrifice coherence for space and vice versa. Trimit also has a bookmarklet set to drop that will give you features similar to the app, but right in your web browser, you can head over to the website to sign up to be notified when it’s available. If you post a lot of articles that have a high amount of text content and you like to summarize and provide context, rather than just dump a link into someone’s lap, then Trimit can make your life a lot easier. If you’re a punctuation, spelling and grammar purist then I don’t think even leaving vowels in is going to make you like the way the text looks much though. If, however, you’re not as concerned with the fidelity of the syntax, and more concerned with getting the point across with as few characters as possible, I’d definitely recommend that you check Trimit out.